What is a New Jersey steelyard doing with a tank? 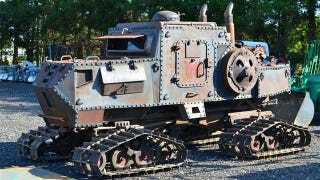 Part snow crawler, part tank, this V8-powered monstrosity has been for sale by a New Jersey steelyard for some time now. So how did an armored crawler ended up in the Garden State? The eBay listing for the Tucker SnoCat is bereft of most details about its heritage or an explanation for the logo on the side door, saying only its a V8-powered beast of indeterminate age and "custom armer." The New Jersey lot wants $5 shy of $14,000 for its beast; we tried to get in touch with the owner about how an Apocalypse-ready snow crawler landed near the Atlantic seaboard, but haven't heard back.